I worked with Christy to purchase my condo. It was a pleasure to have Christy represent me on this deal. Christy went above and beyond her job requirements, including and not limited to keeping me calm, negotiating powerfully on my behalf, executing all loose ends (and there where a few) and even helped unload a car full of personal belongings. Christy was positive and upbeat, professional and a real pleasure to work with. I highly recommend hiring Christy for your real estate acquisitions. You will not be disappointed. "I have been cleaning out files and came across my performance appraisal that you completed on me, many years ago while at Dominion. It reminded me what an inspirational leader you are. In the last 20 years I have been teaching leadership programs you are one of the stand outs that epitomized true leadership with a caring heart!! Just thought I'd let you know what a difference you made to me." It is a pleasure and honor to provide a reference for Ms. Christy Laniado. I know Ms. Laniado well and am in a position to speak about her suitability as a real estate professional. 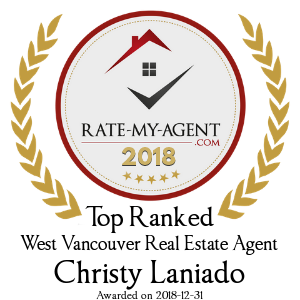 I have known Ms. Laniado for about ten years and have interacted with her on many occasions, both on a personal level within the West Vancouver community and in a professional context in her capacity as an agent in the real estate industry. Over these great many occasions, both in individual and group settings, she has consistently demonstrated qualities that have led me – and others - to admire and respect her for her personal and professional qualities, greatly enjoy her company, and to seek and rely on her advice and counsel. There are a great many adjectives that apply to Ms. Laniado and must be mentioned in order to convey her character and capabilities. She is discernably and markedly mature, wise, intelligent, insightful, well informed, confident, articulate, personable, poised and polished. She has a very strong work ethic. Ms. Laniado displays a very high level of professionalism in her appearance and demeanor. She inspires trust, for a reason. She is very able and reliable; she follows through promptly and very capably on commitments. She provides useful, well-researched and considered information to clients and colleagues. In dealing with others Ms. Laniado is unfailingly professional; but also sensitive, adroit and intuitive in dealing with others. She relates and interacts with people of all ages, and mental and physical ability or state, and does so with genuine interest, courtesy and respect that are sincere. She has a warm sense of humour. Ms. Laniado has a manner that draws people to her, and inspires confidence and trust. People will turn to her for advice. She has an innate instinct for dealing with people. I have witnessed many times her advising others; typically her tenor, aplomb and comments have a visible, positive impact on the other party. Lastly, because of my own background I am very familiar with the type of attributes that are important to successful and ethical practice of a regulated profession, and some of the activities and issues that can arise in the real estate field. An individual who takes on such a position should have a special combination of personality and ability. I am absolutely confident that Ms. Laniado has the necessary qualities in abundance. In short, I highly recommend Ms. Laniado for a real estate agent position. She will be a strong asset to all clients. Please feel free to contact me directly at any time with respect to this reference. VALERIE L. OSBORNE, B.Sc., J.D. "We had a wonderful anniversary thanks to Christy. We were not planning to buy a house or sell our house until we met Christy, thanks to her we found the ideal home. With her savvy knowledge, wisdom and support, we were able to sell our house in less than a week. She is down to earth, trustworthy and great! We are very fortunate to have met Christy! We highly highly recommend her to anyone looking to buy or sell a house."